Spacemen 3 - Lord Can You Hear Me? Well, what do we know about MGMT rockers? They are successful and original and their music remains highly called-for. MGMT are really good at combining independence of indie-rock and incredible atmosphere – the band is often taken as a representative of psychedelic direction in the music. So, it is quite logical to assume that the rockers’ taste and preferences are just fine, that is why the continuation of Late Night Tales series is especially interesting. The very first compilation titled Another Late Night: Fila Brazillia saw the light in 2001, and a lot of the series albums have been released since then. The work, presented by MGMT members Andrew Van Wyngarden and Ben Goldwasser took the number twenty five. Actually such a consistency is a great proof of the fact that Late Night Tales do not lose their popularity. It is worth mentioning that every new episode may differ greatly from its predecessor, and that is a truly fascinating moment. Thus, MGMT presented an excellent compilation of hits. You will find here indie-rock, post-punk and many other genres as well. MGMT themselves are well-known for their diverse sound, and that peculiar feature was transmitted into their great compilation. Twenty one tracks are waiting for the listeners – it is time to enjoy the atmosphere of a new episode of Late Night Tales. Late Night Tales is not a solo project. On the contrary, it is a work, created by the collective. This is probably the main feature of the series, and that is exactly what makes these records so attracting. This time is not an exception. The album’s opening act is a composition Can't See Through It by the band Disco Inferno. Quite a calm song deals perfectly with the role of welcoming track and creates the right mood: thoughtful and melodiousness music – that is the motto of the newest Late Night Tales. However For Belgian Friends by Durutti Column, Stop & Smell The Roses from Television Personalities and many other songs differ from each other dramatically: the energy and forcefulness are quite distant from each other. But they still complete one another, in spite of all the differences. The lyrical mood is dominant during the whole record: Cheval Sombre, The Chills, Spacemen 3 and other masters took the part in the creation of unique, almost psychedelic atmosphere of the long play. Slow or mid-tempo melodies and a great amount of acoustic sound – lovers of indie-rock will enjoy this compilation a lot, that is for sure. MGMT love the unusual sound, so they chose the best compositions that can demonstrate the unique approach to it. Moreover, the compilation album will please music lovers not only with the quality of songs, but also with their quantity. Twenty one track – this is a serious number, and if you count the mix Late Night Tales Continuous Mix, then the total length of the long play will sum up to more than two hours. Is not it the real present to all lovers of independent rock, after all? By the way, Wyngarden and Goldwasser did not forget about the song of their own band. Thus, the cover version of All We Ever Wanted Was Everything by Bauhaus performed by MGMT found its place within the concept of the new Late Night Tales creation. 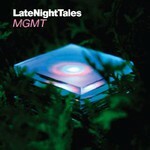 Probably Late Night Tales: MGMT turned out to be wider than it could have been expected. Its diversity of moods and genres is truly impressive. Well, Late Night Tales series got a worthy addition, indeed.